The image of Britannia was first used on Roman coinage over 1,800 years ago and it almost as ancient as the word itself. The figure is seated, yet still recognisable today as Britannia. After the Roman legions left our shores, she did not reappear until the reign of the first Elizabeth, on the title page of a book by John Dee on navigation. 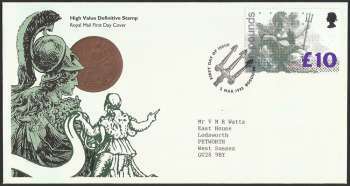 The design on coins altered little over the next 300 years. In Victorian times the 'Penny Britannia' became part of popular culture. The design was also adapted by political cartoonists up to the Second World War and beyond. 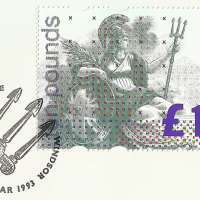 The Penny Britannia design ceased to appear on coins in 1972, although a modified Britannia continues on bank notes to the present day. Perhaps the best-known representation of Britannia is her helmeted head which symbolised the nation on the official 1951 Festival of Britain emblem. Britannia is a symbol of national identity, bound up with our history. 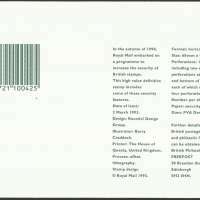 In the autumn of 1990, Royal Mail embarked on a programme to increase the security of British stamps. 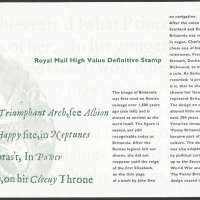 This high value definitive stamp includes some of these security features. Perforations: 15 x 14, including two elliptical perforations at the top and bottom of the stamp, each of which replaces four perforations.